Here at PrinterLogic, we’re a lot like you in a lot of ways. Like you, we hate print servers. So much so that we made it our mission to help you eliminate them completely. To date, we’ve helped hundreds of companies do just that. And, like you, we also need to make decisions every day on which products to use—from IT products to marketing platforms and more—and which vendors we want to work with. So we understand the importance of finding a vendor you trust, and one that you’d be willing to recommend to your colleagues. Which is why we are so humbled that our customers have proven so decisively that PrinterLogic is a product and a brand that is not only trusted, but that they repeatedly recommend. There’s a research firm by the name of TechValidate that many large companies use to perform independent surveys of their customers to determine how well their company or product is living up to its claims. It’s an amazing tool for gaining insight into your customer base, and figuring out what you can do to serve them better. In addition to asking customers for their feedback on product and service-level items, TechValidate also performs a survey to determine your Net Promoter Score (NPS), which is a metric that shows how many current customers would recommend your company to a colleague. We engaged TechValidate several months ago to survey our customers on many topics related to our product, our service, how quickly we helped them establish ROI, and many other topics. And as part of that survey, we also asked TechValidate to measure our NPS. 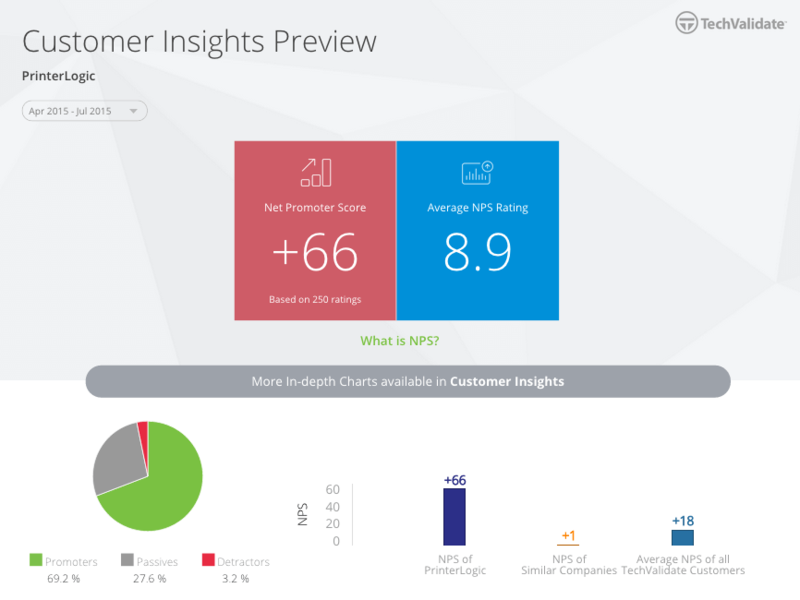 As it turns out, TechValidate has calculated an NPS of +66 with an average NPS rating of 8.9 for PrinterLogic. What on earth does that mean? Well, as TechValidate tells us, those are actually among the highest scores that they have ever seen—for any company, in any market. The average NPS score for other companies in our market is +1, and the average score for all companies across all industries is +18. This means that PrinterLogic customers are greater than 3x more likely to recommend PrinterLogic than the average company. And 66x more likely to recommend PrinterLogic compared to other vendors in our market. These numbers make us very happy—but probably not for the reason you think. They make us happy because this means that our vision—eliminating print servers—not only resonates with our customers, but that we’ve made such a positive impact on their business that they’re willing to recommend us. We’re not just another piece of software—we’re something that is viewed as critical, and something that has changed their business in a fundamental way (through cost savings, reduced complexity, reduced help desk calls, etc.—see our previous blog posts on TechValidate results here). When you dedicate your life to solving a problem, it’s amazing to see that solution being adopted. And even more amazing to see it enthusiastically embraced.